When I say "mom" here - I mean the moms with kids under 10. The mom's who really just want some peace and quiet. And a clean house. Rule #1: Don't buy them something they don't want or really need. Because, if I'm being honest? I have enough stuff in my house. I really don't need anything else. Like really. But if you really feel like you need to get something for a mom with young kids, I've got some ideas here. A gift card. This is a no-brainer and it isn't the boring gift it sounds like. I love my Team-ride cycling classes and have told my parents that a gift card there would be great. I know I'd use it and if they insist on getting me something, this is a great option. Last year (based on my list) my husband got me a gift card to Asha Bath House in Sacramento and that's a great option because it gives me somewhere I can go to escape. Something they need. Ok, not that my whole life revolves around my spin class - but if I'm going to 3-4 classes a week or so - I need clothing choices, a good gym bag, and a few lovely water bottles. I love this ban.do Glitter Bomb Pink Stardust Water Bottle. A bag like the Fjallraven - Kanken Classic Pack would work for packing my shoes and water for the gym and also for holding snacks on hikes with the kids. The ocean green is my favorite color. Also - because of the move and transition all of my coats are in storage and probably way at the back of the unit because we can find them. All I have are some sweaters, blazers and an AMAZING leather jacket. But I really need something more mainstream. This Keswick Velvet Coat is one of my favorites. Something special (and small). There is a reason that jewelry is a go-to gift for the mom/wife in your life. It can be something special AND it doesn't take up a lot of room. I personally just love this Mejuri Evil Eye ring. The extra nice thing about Mejuri jewelry is it doesn't break the bank. Something to read. Yes, books are always a good gift. I've got a whole list of book gift ideas I've already shared. Want a few more book recommendations for moms? Something light like My Not So Perfect Life or Young Jane Young or a parenting book like Simplicity Parenting. Something useful (and meaningful). I've decided that coffee mugs are a thing for me. But I don't mean just pretty ones - I'm talking meaningful ones. I got one from Hamilton in SF and I love using it. It brings back some good memories and thoughts. Something I can use every day that has some sentimental meaning is a great present. 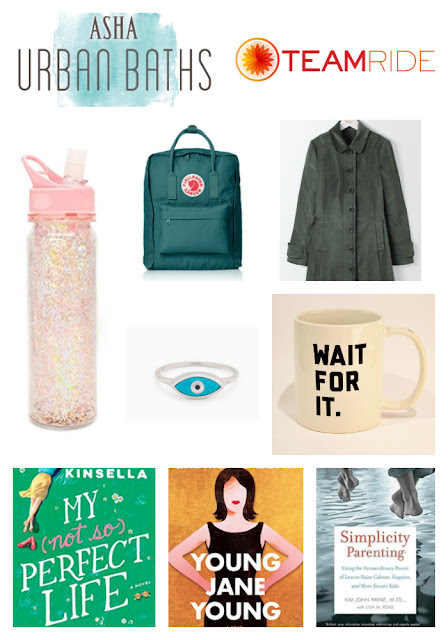 Check out more gift guides on the blog!